Is your bathroom looking dingy and uninspired? It could be due to the lack of lighting in the space. When it comes to makeovers, many homeowners forget that besides the right fixtures and bathroom accessories, lighting is an important element in the room that helps create that perfect ambiance. Artificial lighting is especially important if you don't have sufficient windows that can let in natural illumination. Additionally, having the right fixtures will ensure that users are able to see what they're doing. 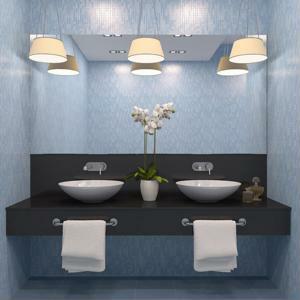 For a truly practical bathroom vanity for everyone's use, opt for wall sconces on each side of the mirror or a pendant light just above the bathroom vanity. In the shower, a ceiling fixture can also be installed to transform the space from a cave to a brightly lit spot. Even the flickering light of candles can help change the mood in the space. For an hour or so of relaxation in the bathtub, light up some candles, turn of all the lights, lay back and enjoy the calm.